Coral View Island Resort straddles the headland that separates what is known as Main Beach (to the left when looking at the sea) and Turtle Bay (to the right) and has a tonne of bungalows running in both directions and well inland up the slope of the small hill behind the resort. It has a staggering variety of rooms and pricepoints -- so many that when they showed us the map we just took a photo of it so we wouldn’t have to summarise it. Chalets have steep blue roofs and while they look quite small from outside, they’re generously sized within. We were shown a Deluxe Garden View (from 250 ringgit) and though a little dark inside, it was comfortable with an oddly furnished sitting room and the bedroom in a semi-separate room behind it. Furniture and decor was a little frumpy, particularly considering it probably hosts sweaty sunoiled bodies on a daily basis, but it looked comfortable regardless. There’s also a small deck sitting area out front. Staff seemed run off their feet when we visited, but they were very courteous and happy to spend time showing us around. The large but dry restuarant looks to do a solid job catering to the guests in the 100-plus rooms. Popular, especially on weekends, and reservations are a very good idea, but do shop online for a discounted rate. 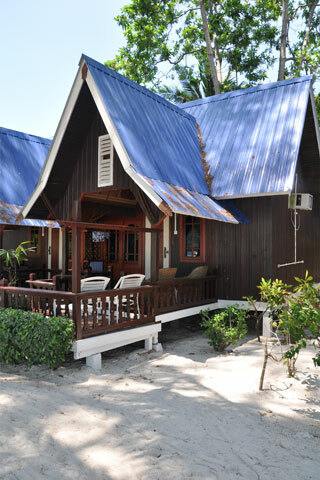 This is a good option for those who don’t want to go up to the spendy level of Perhentian Island Resort a short walk away.